After having had two wonderful romantic weeks with DH, it was great fun to spend the rest of our time in LA en famille. We organized the remaining time around places that teenagers enjoy too, so started by spending a couple of nights on Sunset Boulevard and then moved on to Venice and Santa Monica before heading back home. The Sunset Marquis is a cool hotel which has its history, heart and soul rooted in the music business. Black and white photographs of rock stars and musicians who've stayed there line the lobby and lounge areas, and there's a recording studio which you can book along with your room. 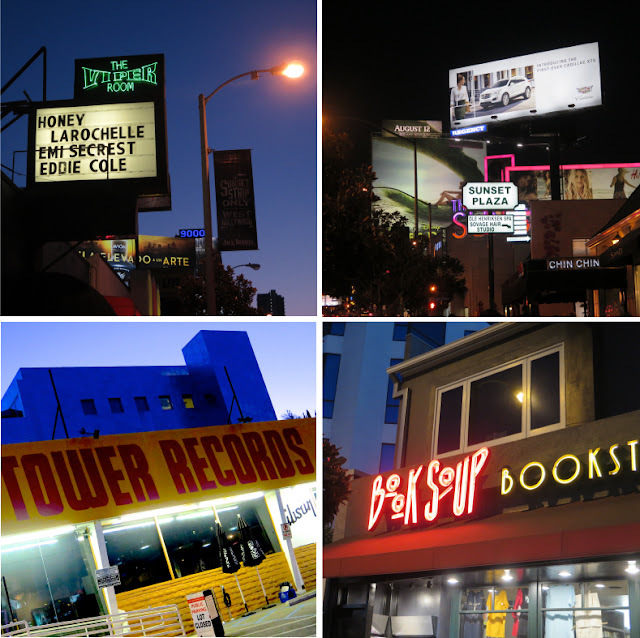 Many well known film scores have been born there.. The restaurant is open on three sides and surrounded by water features and lush vegetation. It's a great place to have dinner, and the rain forrest setting lets you easily forget that you're right on Sunset Blvd, LA's most iconic strip. No need to explain who's breakfast this is! Room with a view. The Mondrian is another excellent place to stay with older kids.. it's funky, groovy and hip, and has a great location. Its cool rooftop pool area is a magnet for the young social media crowd, which provides plenty of interesting entertainment! 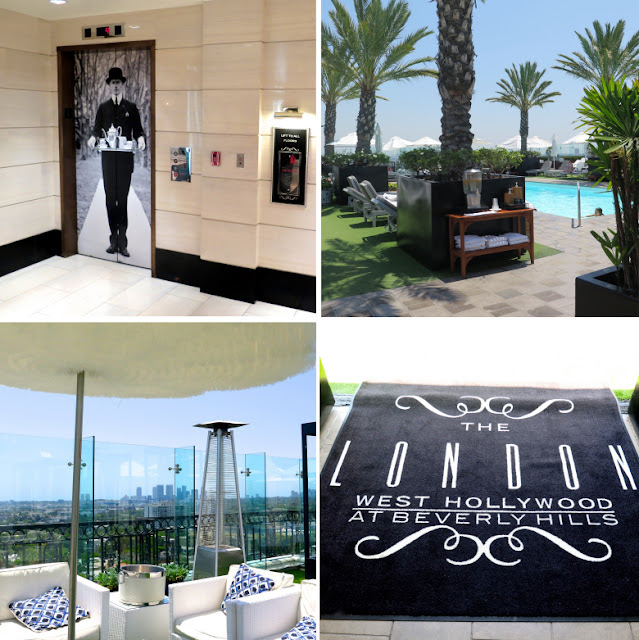 The Mondrian's Skybar with sweeping views over Los Angeles and Downtown. A perfect place to have a light dinner from the small but tempting bar menu. The pool shares the same stunning views as the skybar, so it's not a surprise that it turns into a photo location for Instagram celebrities in the afternoons. Sunset boulevard at night.. it makes you feel like you're strolling through a movie! 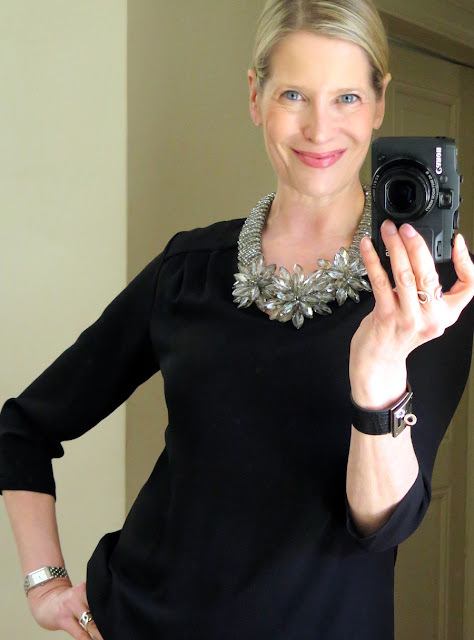 I wore a simple black tunic top and pants, dressed up with the new Flower Crystal MaiTai Collection statement necklace (available here). It could not have had a more sparkling debut! On the other hand, DS' preferred eateries were the food corners in shopping malls. The variety, freshness and quality on offer were superb, and definitely worth a visit (at least in DS's book)! One of the shops I enjoyed the most is the super stylish interior design shop 'Restoration Hardware' on Melrose. Thank you again talented and dearest Annie for recommending it (she also shared the Jady skincare tip with me.. what would I do without her!) If you are looking for inspiration for your home or work place, the Restoration Hardware is definitely a place to look at... I could move right in and be very happy! Even if you're not interested in decorating, it is worth a visit for it's space and style.. the roof terrace has been constructed as a public space. You can settle down with a book in one of the many beautiful seating arrangements, or play a game of ping-pong or pool billiards. You see school study groups meeting there, or people just coming to take a break and enjoy the view to the soothing sound of the trickling fountains. More inspiration from dear and stylish friends.. what are the perfect coolers to go with Hendricks Gin? Home-made cucumber ice globes! When you've seen them you'll want them. To make these jumbo coolers which have the added advantage of melting less quickly of course, you'll need an ice ball mold (you can find them on amazon etc), and some pretty colored fruit or vegetables.. you can substitute the cucumber with strawberries, lime, raspberries.. the options are endless! Thanks so much dearest Dot for sharing, I always learn something from you. Everyone needs a break from time to time! Just in time, a little bird whispered in my ear the name of this beautiful textile shop... 'Hollywood at Home'. 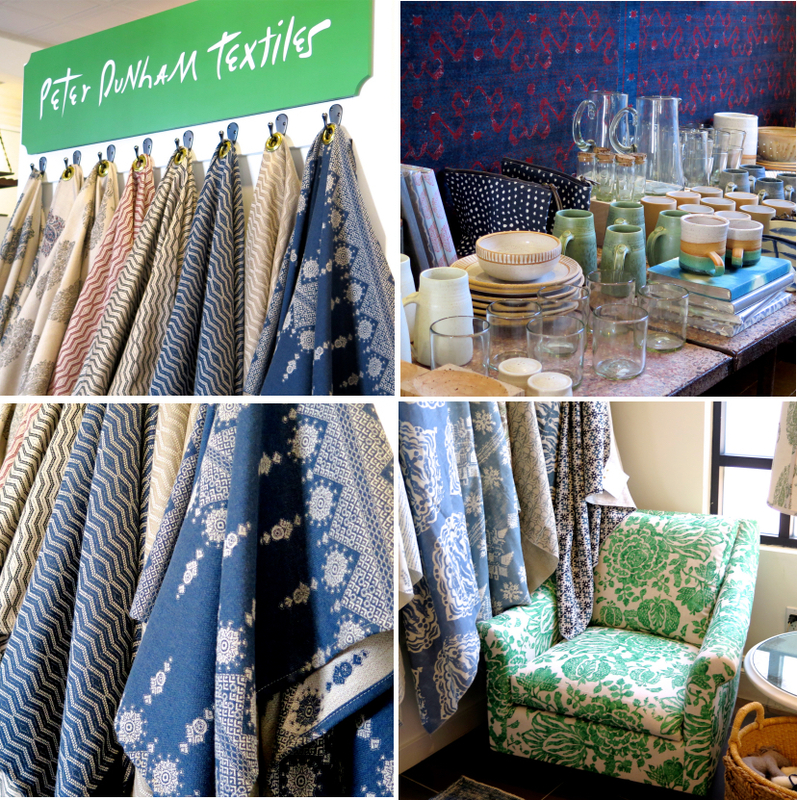 Peter Dunham's fabrics are gorgeous and I am so glad I visited. Thanks so much again for the tip dear D.D.! I could have taken each and every cushion home with me..
Il Piccolino is a charming Italian trattoria co-owned by LA veteran restaurateurs Eddie Kerkhof (Le Dôme) and Silvio de Mori. It has two lovely terracotta tiled terraces surrounded by walls of plants, and makes you feel as though you are sitting in the middle of a beautiful garden. The food is fresh and mostly organic and the service is charming and attentive. The perfect setting for long and memorable lunches.. we met up with friends (including the already mentioned interior designer dream team Dot and Annie of course), and our lunch stretched well into the afternoon. What a happy time it was! As do I. Each new sparkly addition is even prettier than the last! I actually got lost in our Restoration Hardware - it's huge. But, it's certainly not a bad place to be lost in except maybe for your wallet. I head right to the linen department, as unfortunately, most of the furniture is too big for my small house. You can certainly tell that this company was born in California, the land of big. It looks like DS had a wonderful time grazing his way through LA. When you have a teenage boy's metabolism, the sky's the limit . . . sigh. PS - Love the cucumber ice globes - too cool for school! I don't know which I like better--the new necklace or the cucumber ice globes! Now that it's September, and the rumor is that temps might start to lower, I'm hoping for some scarf weather! Thanks for sharing your lovely trip! Thank you dearest Jerrine and Greta for the lovely welcome for the new sparkles! You are so lucky you have a local Restoration Hardware store, how I wish they'd come to France one day! Greta, hope your scarf weather has arrived! We are still sveltering, it is much too hot for this time of year. The weather forcast promises more sun and high temperatures..I'm praying for rain! The shopping looks epic! Of course, it's LA! The fabric is very inspirational. What a super-fun post! Maybe I'm still a teen at heart because I loved it all! 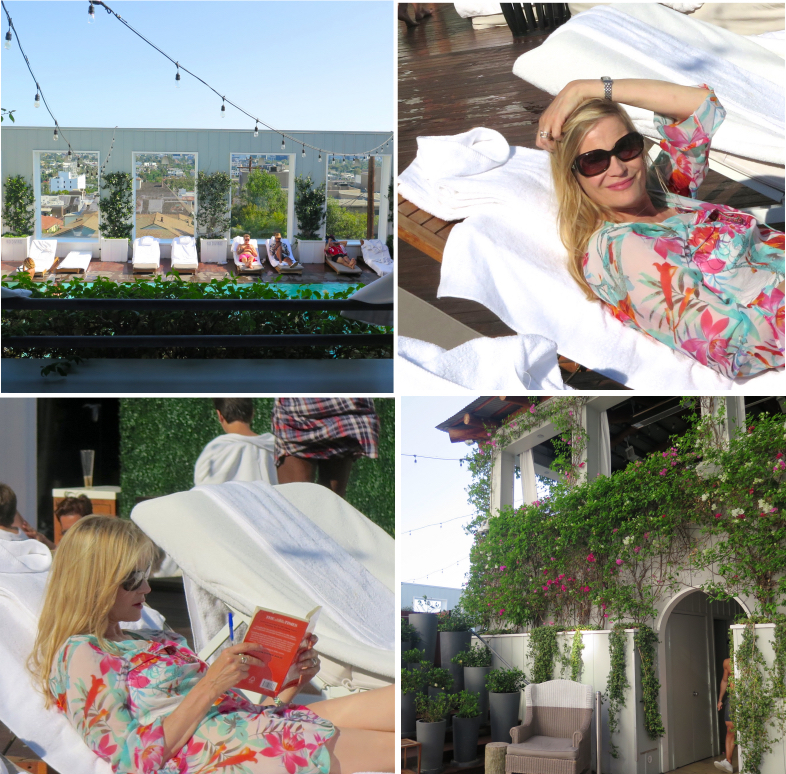 (Although the wonderful rooftop bars might tempt me back into adulthood...) Thank you so very much, dear MT, for sharing your colorful, sunny L.A. trip with us. again I had so much fun reading your travel diary, enjoying the beautiful pictures and checking online the places you spent so wonderful time with your family. Shall I one day to go to California, I just have to re check the adresses and opening hours from your trip et voila, hotel, interesting shops, restaurants .... everything would be the finest. Love the new necklace too. Are there any chances, one day you would design a belt? Further I am realky happy that ordering from the US to Europe is such a pain with taxes and customs that the temptation, to order from Restauration Hardware and Hollywood at home are not so big. So fun hopping from rooftop to rooftop and everything in between with you and your boys! Congrats on yet another beautiful necklace launch! I am sure you will sell out in no time! Thank you for coming along, dearest Katja, it is always such a treat to re-live the trip in the company of the swan club! More teenage-proof outings in the new Santa Monica/Venice post, all tried and tested by DS (who declares that LA is his favorite place). Much love and have a great week! Thank you for all this.. Thank you Linda, so happy you enjoyed it! What a very interesting last travelogue dear Mai Tai. And fantastic pictures. I know these addresses but really very useful for your followers or friends who will go there. Really appreciable. Even me, I would be happy to return because it does not look to have changed too much as many many other parts in the world. Thank you for taking us with you on this visit to the States, dearest Mai Tai. It has been a pleasure to see new places, unknown to me. Congratulations on the new necklace. Like dear Trudye said I am sure it will sell out very quickly. I just wanted to let you know that, thanks to you, we visited Raplh's in Paris this summer. It was a late dinner and it was truly magical. I never would have considered hat place if it weren't for you. So very happy to know that you had a wonderful time at Ralph's, many thanks for letting me know! It's a magical place indeed.. and a perfect little oasis for a romantic al fresco dinner.